Liverpool has experienced a four-fold hike in the number of international conferences booked in the city over the last year, with delegate numbers up from 2,800 in 2011 to an expected 9,280 in 2012. In 2011, the city hosted six international conferences, while 26 have so far been confirmed this year. Events that have already taken place include the Global Entrepreneurship Congress, which attracted 3,000 attendees from 125 countries, and the BBC Worldwide Showcase, which attracted 640 international TV buyers. 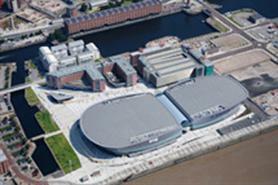 Both events took place at ACC Liverpool, which is home to the BT Convention Centre and Echo Arena. Meanwhile, the ACC today announced that the 15th International Handbell Symposium will come to the city, taking place between 31 July and 4 August, when it is expected to attract 450 handbell ringers from across the globe. Liverpool's events surge comes off the back of recently published figures from Visit Britain, which estimated that 545,000 overseas visitors stayed in the city in 2011, 19% of whom visited for business. Carol O'Reilly, Liverpool Convention Bureau manager, said: "These figures are extremely encouraging and reflect how Liverpool is increasingly earning a reputation as an international destination for high-profile conferences and events. "This is thanks to a number of factors including our connectivity to Europe through our network of airports, major roads and rail travel." Kerrin MacPhie, ACC Liverpool's director of sales, said she was confident that the trend would continue, adding: "We have received positive feedback from delegates who cited our location on Liverpool’s waterfront, our proximity to fantastic leisure attractions, hotels and restaurants and our versatile venue as just some of the reasons they enjoyed their event and their visit to the city."